Conheça a movimentada capital da Guatemala nesta excursão turística de 4 horas pela tarde na Cidade da Guatemala, incluindo embarque no hotel. Oriente-se na maior cidade da América Central ao seguir seu guia em locais de interesse, como a Avenida das Américas, a Plaza de la Constitución e a Catedral Metropolitana. Saiba mais sobre a rica história e tradição da cidade enquanto admira os murais e mosaicos do Banco da Guatemala, procure artesanato no movimentado Mercado Central e explore o vasto complexo comercial Paseo Cayala. 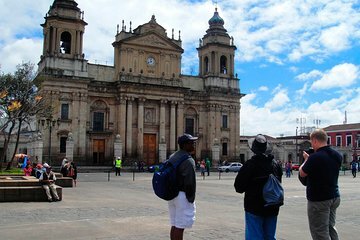 A good overview of Guatemala City. Pleasant, helpful guides. I enjoyed the chance to feel safe walking around the historic section of the city. The Avenue of the Americas and Plaza of Berlin were good bus destinations... only thing I would have changed was there should have been an opportunity to have a drink in the restaurant where Che Guevara and Fidel Castro met to plan revolutions... especially since there were mariachis playing when we walked in. Liked the Cathedral we were blessed to hear a children's choir singing there and the market. Good trip with knowledgable guide. Tour was from 2-6pm and traffic took up alot of the time. Juan Pablo was our tour guide and he was very knowledgeable kind and spoke excellent English. He gave us recommendations on places to eat and let us take our time on our tour. Never felt rushed. The highlight was the central market filled with fruits herbs and souvenirs. Definitely recommend ! It all depends on your guide. Juan Pablo was the best. A fountain of information. I think the trip could be improved with a couple of stops on the Avenue de Americas. We drove past and could not really appreciate the monuments. The tour ended after 3 hours when it mentioned 4 hours on the itinerary. The walk around the market was enjoyable...local craft and produce looked fantastic. The tour guide was great and van was brand new. The only difficulty was that we were with a Spanish speaking couple so everything was said in both english and Spanish back and forth the whole time. The content on the tour was a little dry. I can’t say I got too excited about much in Guatemala City. The driving and walking tour was approx. 2.5 hours, not 4. Juan Pablo provided insights into the history of Guatemala as a whole and the main plaza, markets and statues in Guatemala City. It was a good overview. Next time, I'll have to make time to eat at the El Portal restaurant. We enjoyed a delightful afternoon touring around Guatemala City with Juan Pablo. His knowledge of the city and his enthusiasm was boundless. He was engaging and very informative. We went to see a part of the Berlin Wall that was a gift to the city, as well as visiting two historic churches all while getting a history of the city.We also to a local food/flower market which was quite beautiful and then ended our tour at an artisans market where we were able to shop and browse around for over a half hour. We were picked up at our hotel on time, driven in a very clean, air conditioned van. If you have the time, this is a great way to get both an overview of the history of the city and a chance to get to a few hidden gems that you would not find on your own. Book this, you won't be disappointed .